The Duke and Duchess of Cambridge have completed the first day of their two day visit to Northern Ireland. Prince William and Catherine are carrying out a series of public engagements at a range of locations as part of their visit. It is the third time the royal couple have visited the region together. 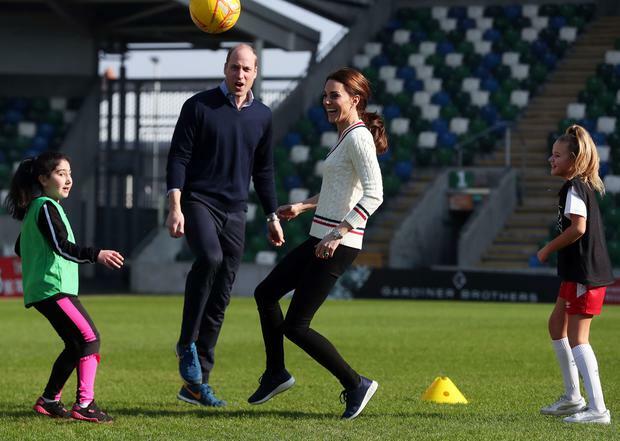 Their first visit was to Windsor Park, the home of the Northern Ireland national football team, where they learnt about initiatives to get more women in "key decision roles within football" and a programme aimed at young people who are not in employment, education or training. They took to the pitch, where they watched primary school children from across Belfast take part in some of the Irish Football Association Foundation’s initiatives, after touring the Irish FA’s Education and Heritage Centre. They later travelled to the Roscor Youth Village charity in Co Fermanagh, which is a residential activity centre for children referred by social workers. The Duke and Duchess of Cambridge were greeted by a crowd of cheering children at a youth facility in Co Fermanagh. William and Kate were met by Roland Eadie, the Deputy Lieutenant of County Fermanagh and his wife, Mary Kathleen Doherty; Fermanagh and Omagh Council's chairman Howard Thornton, and chief executive Brendan Hegarty; Derek McCabe, the chairman of Extern Group and its chief executive Charlie Mack, as well as Mark Rodgers from Roscor Youth Village. They watched on as children played in a series of activities at the youth facility. Meanwhile, William's balance was tested as he walked across a low-ropes assault course. 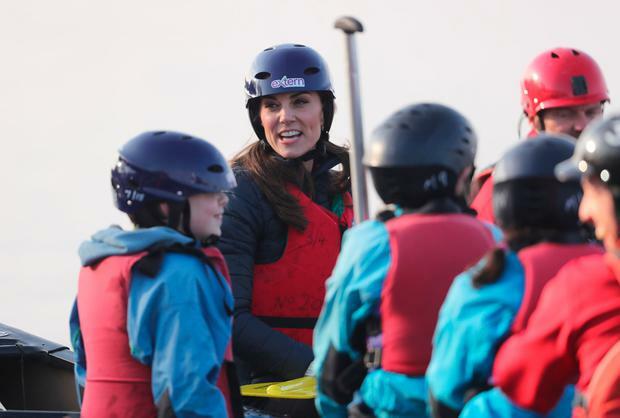 Kate and Will went head-to-head in a canoeing race on Lough Erne. William's team was crowned the winner, reaching the marker a few seconds ahead of Kate's team. The Duke and Duchess of Cambridge then visited Belfast entertainment venue the Empire Music Hall for their final engagement of the day. They were greeted on arrival by cheering crowds who had gathered on Botanic Avenue. Kate wore a light grey Missoni dress for the event. Lord Lieutenant of Belfast Fionnuala Jay-O'Boyle and manager of the Empire, Stephen Bradley, extended the official welcome to the royal couple to the event where inspirational young leaders have come together to be celebrated. Kate and William met former Olympian Dame Mary Peters who was earlier today appointed to the Order of the Garter, as well as a number of young people from her trust organisation, which helps aspiring athletes. Comedian Shane Todd performed as the royal couple engaged in conversations with those in attendance. He joked: "Everyone seems excited for some reason, I met them at the door, they were very nervous but hid it well." 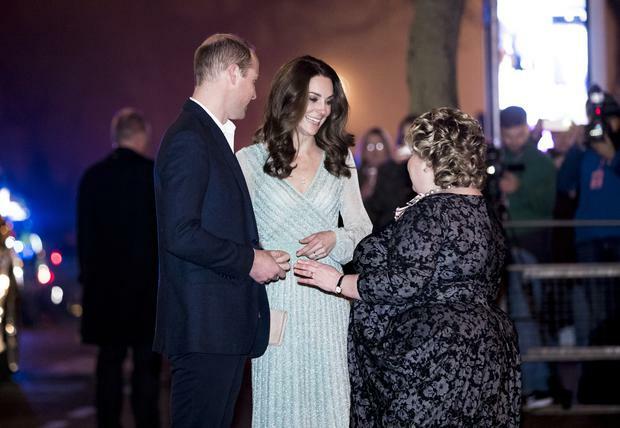 The Royal couple laughed and exchanged jokes as they got behind the bar at the Empire Music Hall and attempted to pour a few pints. William then took to the stage to make a brief speech. He said it was "fitting" to recognise Dame Mary, who he said had "helped inspire so many of you in the first place". He added: "Mary Peters is not only one of the United Kingdom's sporting legends, she's also inspired generation after generation to come together in times of trouble and work for the common good - a lesson I hope many of us can learn from." The Royal couple then departed the venue, waving to the gathered crowds, ahead of another full day of engagements on Thursday. The Duchess of Cambridge speak to fans as she arrives for a visit to Windsor Park, Belfast as part of a two day visit to Northern Ireland. PRESS ASSOCIATION Photo.